Proudly displaying the history of Saskatchewan hockey, the Hall of Fame is a testament to those that have helped to make the game great. If find yourself travelling down the Trans Canada Highway and passing through Swift Current, or you otherwise happen to be here for a particular event be it a sporting event or something else, you may want to carve a little time out of your schedule to discover where the heart of Saskatchewan’s hockey lies at the newly opened Saskatchewan Hockey Hall of Fame. This past July I was lucky enough to be invited to the very first induction ceremony of the Hall of Fame. 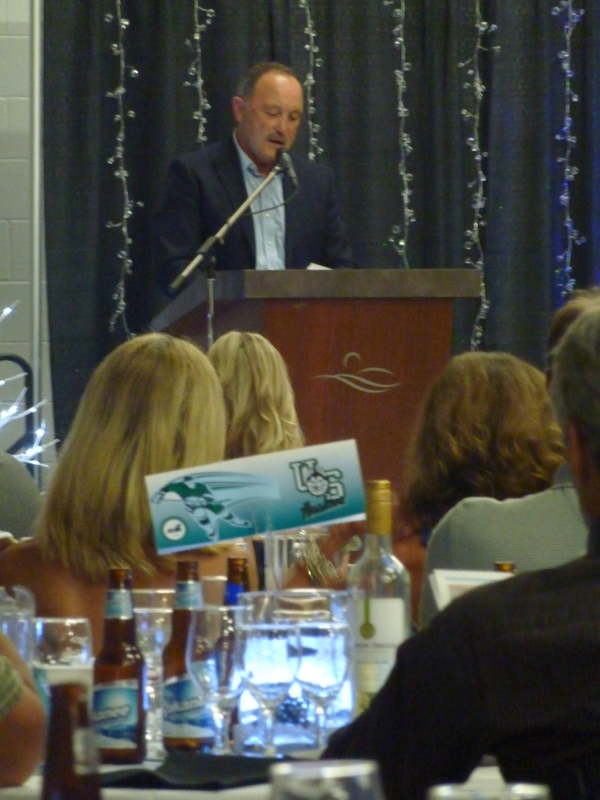 There seated amongst such hockey greats as Bryan Trottier, Fred Sasakamoose and members of various championship hockey teams, I learned a lot more about Saskatchewan’s proud role in Canada’s national pastime than I ever knew before. I learned that Fred Saskamoose was the first First Nations member of the NHL, that Bryan Trottier like so many before him, experienced the game of hockey for the first time on a frozen section of the Frenchman River, and that as Pere Murray founder of the Notre Dame Hounds would say “Adversity builds strength,” something the Swift Current Broncos, whose 1989 Memorial Cup Championship team also inducted, had learned firsthand. The Seaman Wheatkings won 10 years of successive championships. 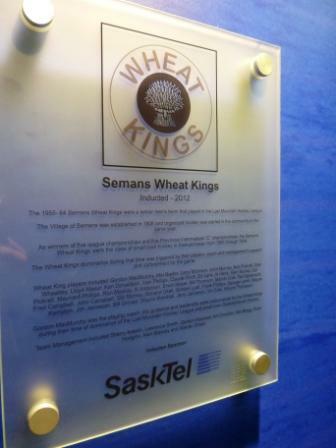 I also learned that you don’t have to be a millionaire or have played in the NHL to be a part of Saskatchewan’s Hockey history, as the members of the Seaman Wheatkings can attest after their own induction which was based on their League Championship run from 1955-1964. Wandering through the pieces of hockey history that are so proudly displayed, it’s nice to see that the Board of the Hockey Hall of Fame decided that they would do it right. From it’s classic hockey stick chandelier to it’s display cases, (which fyi happen to be built to the same size and specifications as the Canadian Hockey Hall of Fame cases), to it’s rink-like atmosphere, right down to it’s own penalty box. 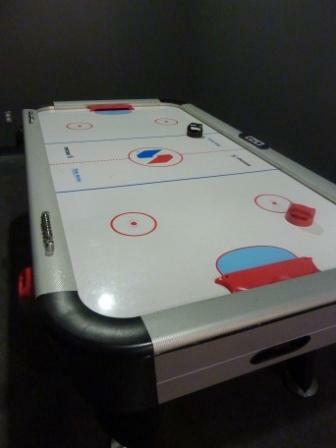 Play a game of air hockey when you take a break from wandering the displays. Designed to be interactive as well as a showpiece, while they aren’t fully operational yet, soon you’ll be able to sit back and watch a number of vignettes and hockey shorts in their theatre area lined with hockey benches; see some of the classic brawls (mostly of Saskatchewan’s Tiger Williams) from the vantage point of the penalty box; or see some action yourself as you play a game or two of air hockey on the table that sits just off from the main display area. 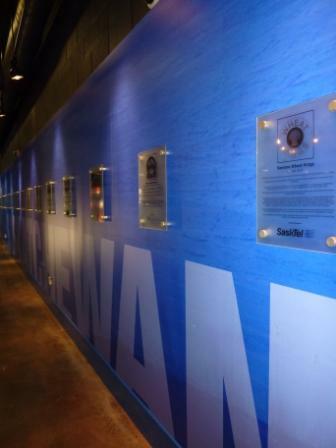 As for the inductees themselves, in addition to the displays currently on loan from the Saskatchewan Sports Hall of Fame that include old jerseys, sticks, pieces of equipment, framed photographs, and various bits and pieces of hockey memorabilia, the Hall of Fame also features a wall of honour where plaques of the current inductees and all future inductees will reside. Set atop at backdrop of a scene captured by photographer Douglas Walker of a frozen Kenosee Lake, where players play a little pond hockey by light of the moon, the photo and indeed the Hall of Fame embodies the very spirit and tenacity of what playing hockey in Saskatchewan has always been about. 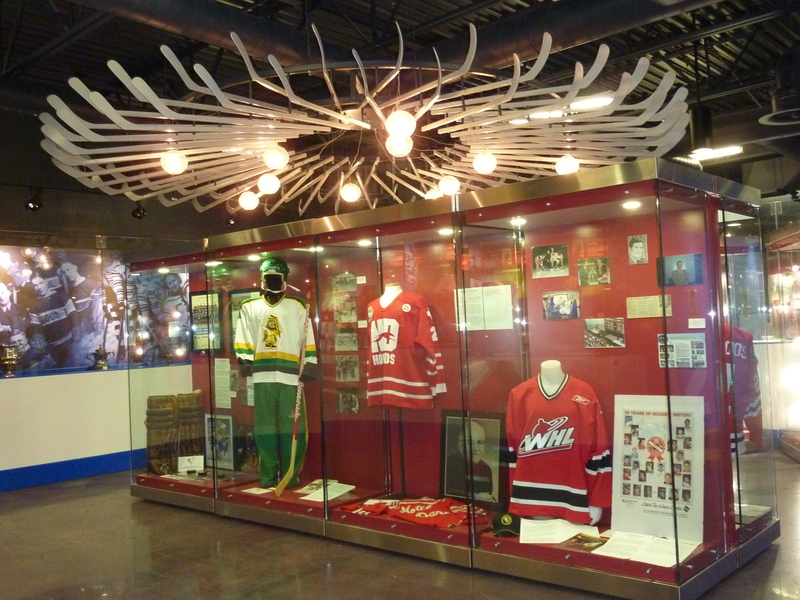 Hockey and its rich history is at the heart of Saskatchewan, and that heart is now proudly on display at the Saskatchewan Hockey Hall of Fame located in Swift Current a GoHere Destination all it’s own. 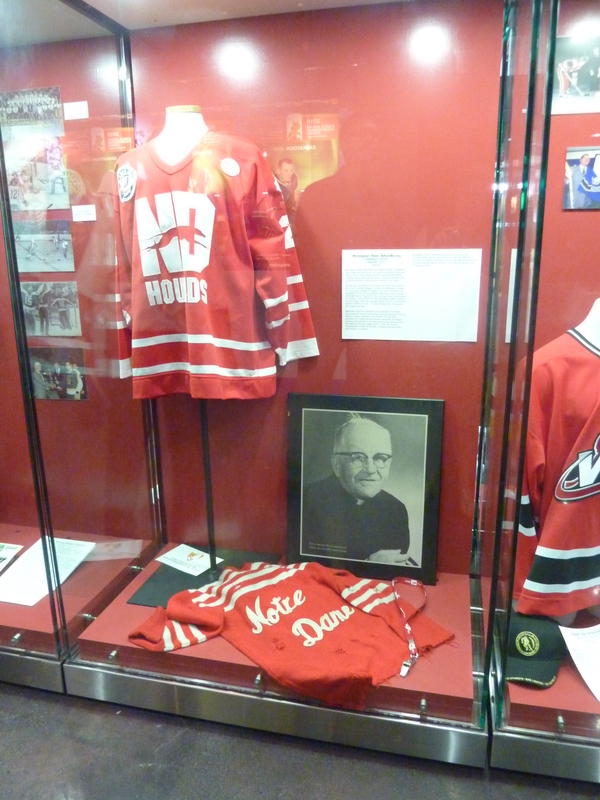 How to GoHere: The Saskatchewan Hockey Hall of Fame can be found in the home of the Swift Current Broncos at the Credit Union I-Plex. Drive around to the back of the I-Plex (which brings you to the second floor) and enter at the separate outside entrance. During Bronco Game Days, and special curling events the Hall of Fame will be open for viewing, simply walk on down the hall. Gotta Go? : One of the great things that happened with the renovation of the I-Plex was the renovation and addition of even more ladies washrooms. Located just down the hall from the Hall of Fame, they’re a modern marvel and there’s plenty to go around. The Hockey Hall of Fame is open Tuesday – Saturdays 1:00 – 5:00 pm, and on Bronco’s Game Days it’s open 1:00 – 4:00pm and 6:00 – 7:00 pm. If you Go to the Hockey Hall of Fame the gentleman you’ll see behind the desk is George Bowditch. Let him regale you with all his hockey trivia knowledge it will make the experience that much more enjoyable. The Hall of Fame can be rented for birthday parties, team get-togethers, meetings or other events and can even host school tours. If you have anything you think might be of interest for the Hall of Fame, whether it be a donation or a loan let George know, he’s actively looking for memorabilia. George is hoping the artifacts former owners will ensure a ghost or two hangs out at the Hockey Hall of Fame – so be on the lookout! Future plans for the SK HHOF include hosting autograph sessions, book signings, special hockey-styled guests, and even trophies from the Canadian Hockey Hall of Fame that are on tour. 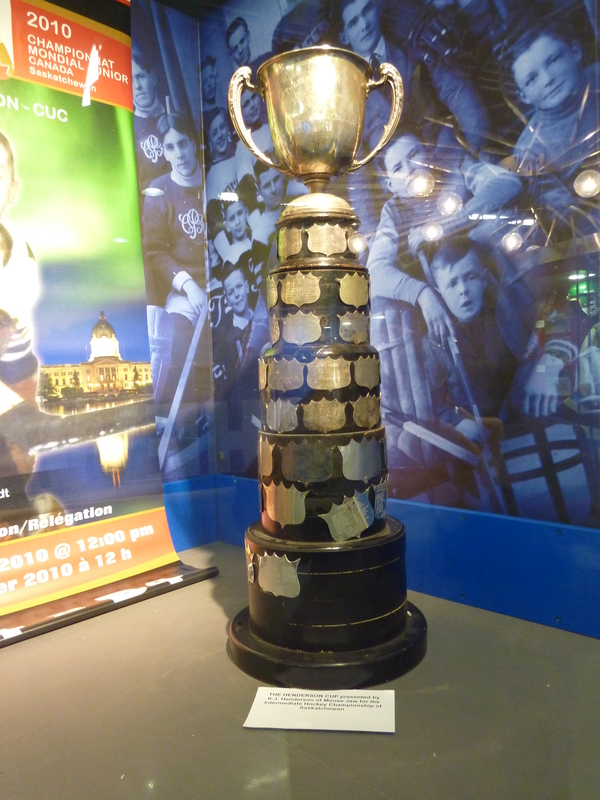 The trophies that are held in the SK HHOF date as far back as 1906. There are two seasons in Saskatchewan – Summer and Hockey.